Here is the download link and description of the new Google App called Google Go. This Android Application comes with new user experience and faster loading of pages. If you are not comfortable with Chrome for Android, then this app will be of help. I am sure you must have heard of Google recent Go Apps. These apps are a lower version of the original app which helps users use little Mb on their activities. Anybody can download from play store. Google Go app is fast in loading pages and opens Google as fast as possible when you search for a Word. Even with a low connection, you can still open a page fast with as low as 12kb per sec. Another new feature included is the jQuery scroll which you don't need to tap the next button. An example of this feature is already implemented on this blog. 1. Get answers quickly and reliably with Google Go, even on slow connections and smartphones with low space. At 5MB in size, it’s fast to download and saves space on your phone. 2. Type less, discover more. Save time by tapping your way through trending queries and topics, or by using your voice to say what you’re looking for. 3. Everything you need in one app. 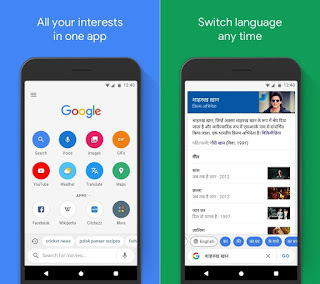 Easily and quickly access your favorite apps and websites, as well as images, videos, and information on the things you care about - all from Google Go. 4. Don’t miss out on what’s popular and trending. Explore the latest trending topics just by tapping Search. 5. Find the perfect greetings to share with loved ones. Tap on “Images” or “GIFs” to find the best photos and animated greetings to liven up your chats. 6. Easily switch between languages. Set a second language to switch your search results to or from at any time. Click Here to download via play store!